Borough of Poole: Pure Town Planning made a very successful appearance at Planning Committee last week, with Matt presenting deputations on two separate schemes at the Borough of Poole Planning Committee. 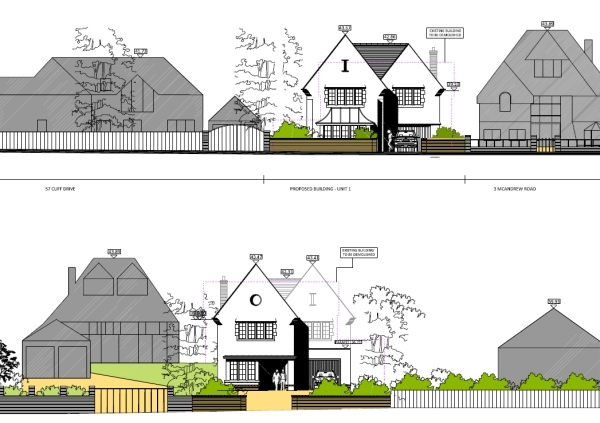 The first application (above) related to the replacement of a bungalow with four back-to-back town houses in Penn Hill. PTP had secured planning permission for a similar scheme on this site back in April 2013 (see here). The new owners wanted to make some changes to the approved scheme, but because of a Ward Councillor “call in” the application had to be determined at Planning Committee. Matt presented his deputation to the Planning Board justifying why the altered scheme would not be harmful to the character of the area or overlook neighbouring properties and therefore why the members should grant planning permission. It was put to the vote and the application was unanimously granted by the Members. The second application related to a plot split in Canford Cliffs. A scheme was prepared which proposed the demolition of an existing 2 storey, 4 bedroom house with dual road frontage and its replacement with 2 detached 4 bedroom dwellings (one facing the road to the north, the other facing the road to the south of the existing site). Again the application was ‘called in’ by a Ward Councillor meaning the Planning Committee had the final say. Again Matt compiled his arguments and presented a 4 minute deputation to the Planning Board to convince them to vote in favour of approving the development. Whilst this one was not unanimous (two Councillors who voted against and one abstained) the end result was the same as the majority (seven) of the Councillors sitting on the planning board voted to grant planning permission. Both of these schemes were designed and submitted by local architects Anders Roberts Cheer and Pure Town Planning were instructed at the end of the process to get the schemes over the line and receive the all important planning permission. We are finding that demand is growing for our ‘Planning Committee deputation service’ as a number of architects and householder clients have seen the benefit that having a professional planning consultancy to present a comprehensive argument to the Committee can bring. If you have an application going to committee and feel you would benefit from someone experienced addressing the Members for you then give Pure Town Planning a call and let us push home the approval home for you.